Half Flower is a large evergreen shrub, found on tropical beaches of Indian Ocean. 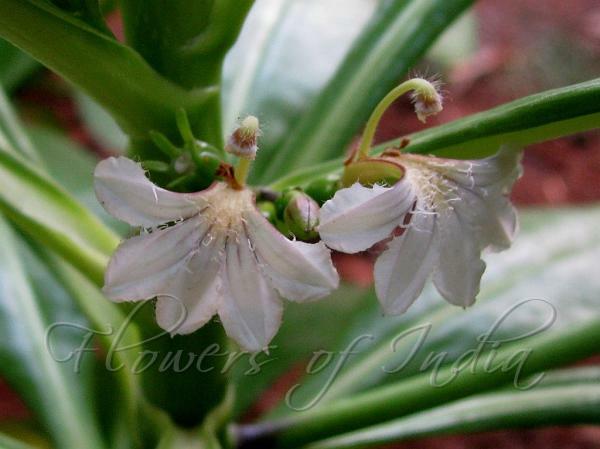 The flowers are composed of five white to pale purple petals in a distinctive fan shape, hence the common name half-flower. The flowers are produced throughout the year. The shrub can reach 3-4 m in height, and the glossy, light green leaves can range from 5-15 cm long. The plant is able to quickly colonize areas because it easily roots wherever branches come in contact with the ground. For this reason, it was introduced to coastal areas outside of its native distribution to be used for erosion control. The fleshy white fruit contains lightweight, buoyant seeds. The seeds remain viable even after prolonged exposure to sea water, but will only germinate in fresh water. Photographed at Sagar Upavan, Mumbai.